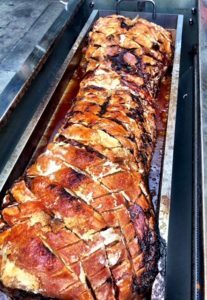 It’s been another successful week here at Hog Roast Hockley, as the team have been providing their first class catering to another bunch of lucky customers. One client in particular for this week, was Kerry, one of the managers at a local recycling plant. Kerry asked us to provide one of our famous Hog Roasts for her hardworking team, whom she had invited for dinner after their shift. She met with us prior to the event in order to arrange the particulars, such as choice of menu and time of serving. There were over sixty members of staff from the recycling plant, that were expected to attend, and Kerry had selected for us to serve our wonderful Hog Roast with crusty bread rolls and a selection of sauces – affectionately known as our Pigs in Buns. In addition, she had also asked us to provide a small selection of desserts, and so our chef prepared a light and fluffy, creamy cheesecake and a zesty Lemon Tart for afters. On the day of the event, the team from Hog Roast Hockley arrived on site by twelve noon, in order to begin the cooking process and have everything ready for the serve time of half five in the evening. First the chef prepared the hog and placed it on the machine to roast slowly over time. We slow cook all our meats to achieve the most succulent of finishes and the crispiest of crackling, turning food into cuisine. As the chef cooked, our catering assistant arranged the disposable plates as well as a selection of sauces and bread rolls. The sixty or so guests soon arrived after their shifts and were delighted when they saw the sight of the hog roasting, coupled with its glorious scent from cooking. All the guests thoroughly enjoyed their meals, as well as their desserts afterwards, and Kerry was extremely pleased with how well her Hog Roast surprise was received. She thanked us for helping to make her event that marked ten years of recycling, a happy one. With nothing left to do, the team from Hog Roast Hockley discreetly tidied away their mess and left their guests to enjoy their evening. The Half Century Hog Roast With Hog Roast Brightlingsea!